Total spent: £4.80 or £1.20 per person. 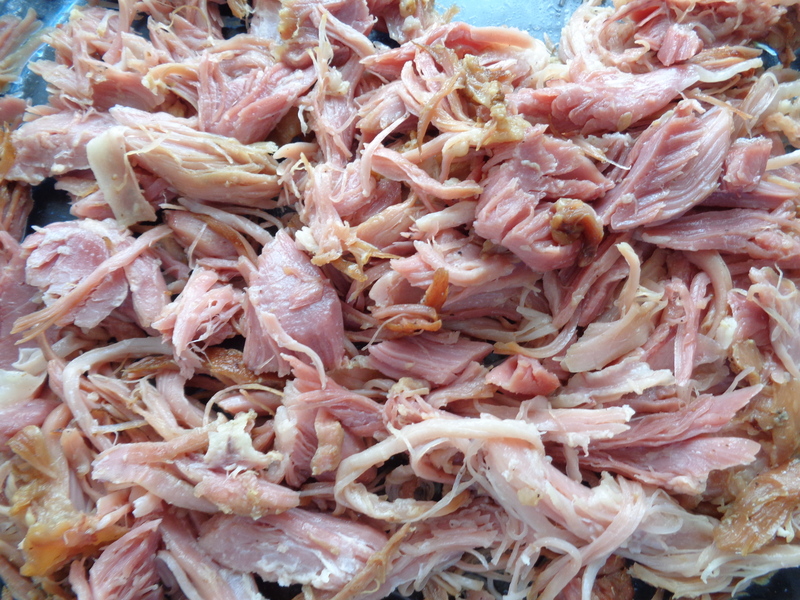 For this dish, a piece of pork that will deliver long strings of meat when pulling a part. The knuckle had that. The best place to find such a piece of meat on a budget would be at the local butcher. The pepper was bought at the fruits & veges market. Had 15 peppers for £1.00 and only used 3. Unwrap and wash the meat and make 3 to 4 deep scoring on it. Peel and dice onion and garlic. Rinse and cut the peppers (red, yellow & green). Remove the olives from the jar and rise. 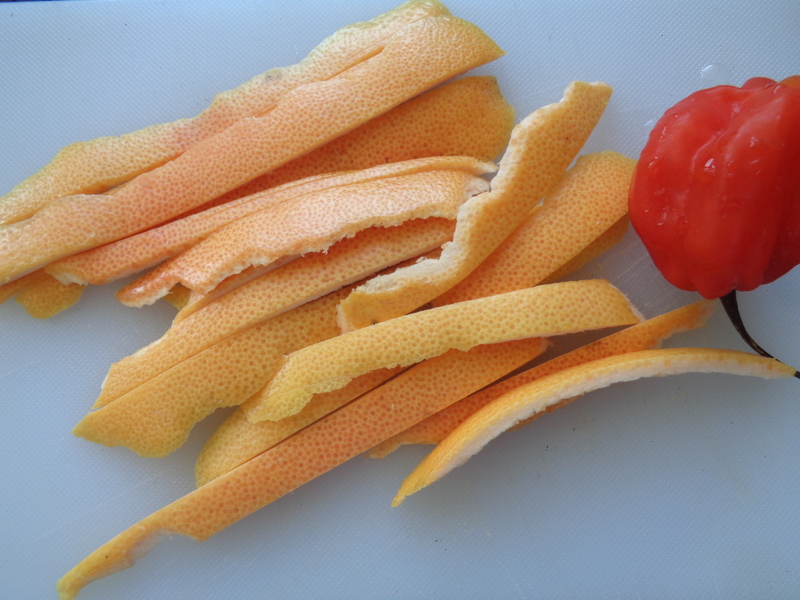 Peel the skin off the grapefruit and cut it (the skin) in strings… This will add a hint of bitterness to the dish. Set the prepared ingredients aside separately. In a dip sauce pan, heat 3 tablespoons of olive oil with a hand full of onion, then seal the meat on all sides for about 1 minute each. Once the meat has been sealed, pour on it the stock and add garlic, cumin, scotch bonnet, black pepper, grapefruit peels, vinegar and cover the pan. 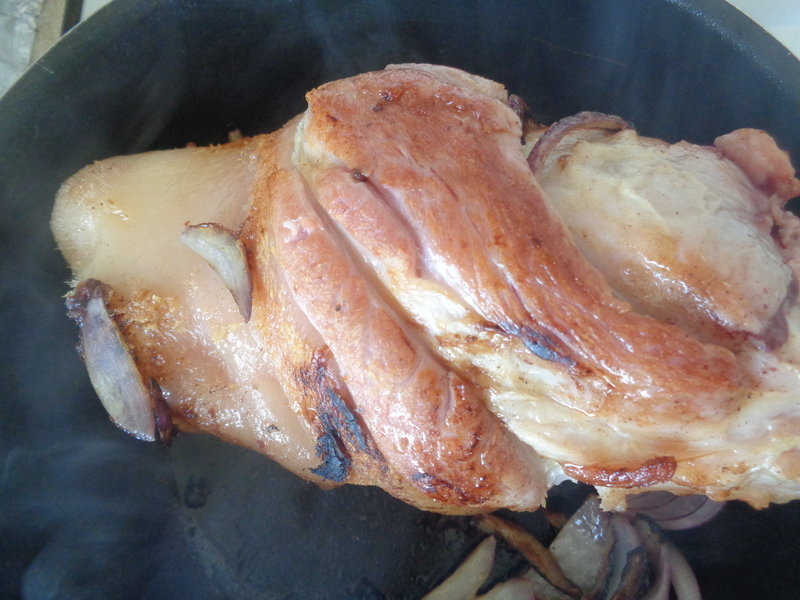 Leave the meat to cook until it falls off the bone. 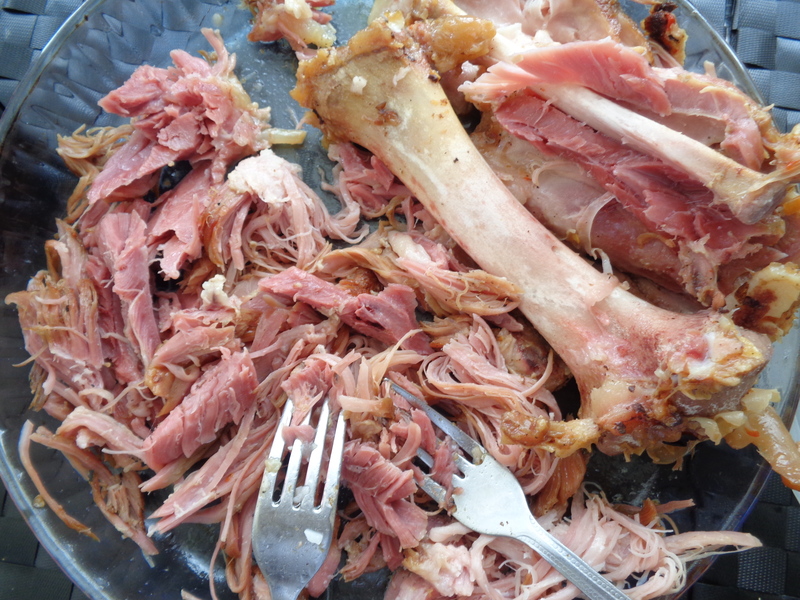 An hour and half to 2 hours should suffice for the meat to fall off the bone. avoid the sauce sticking to the bottom of the pan. We are looking here for the tomato to cook through and for at least ¾ of the liquid coming from the tomato to evaporate. Meanwhile, pull the meat apart, make it as stringing as possible. Discard the skin, bones and fat. All with need for the dish is the red meat… Set aside until the tomato sauce is ready. 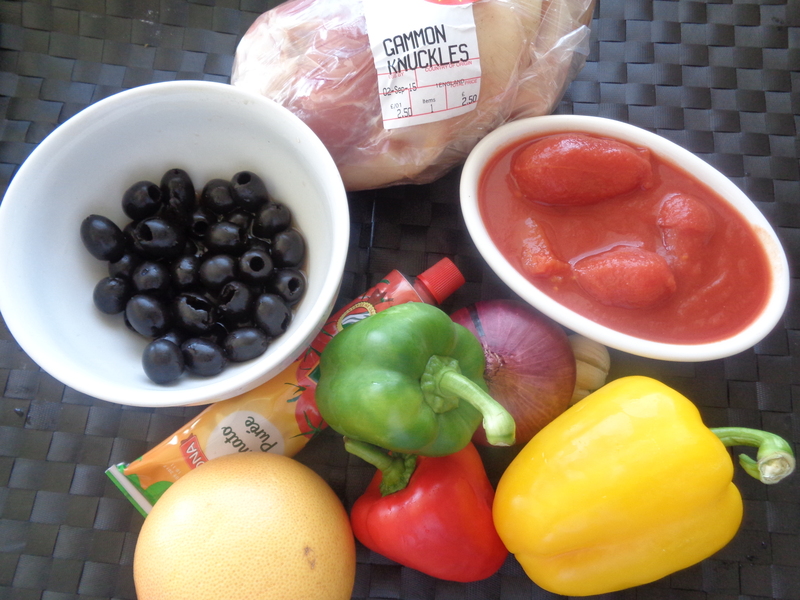 meat in the tomato with the olives, the cut mix peppers and the rest of onion. Mix well, taste and cover and allow to simmer for another 10 minutes. Done. 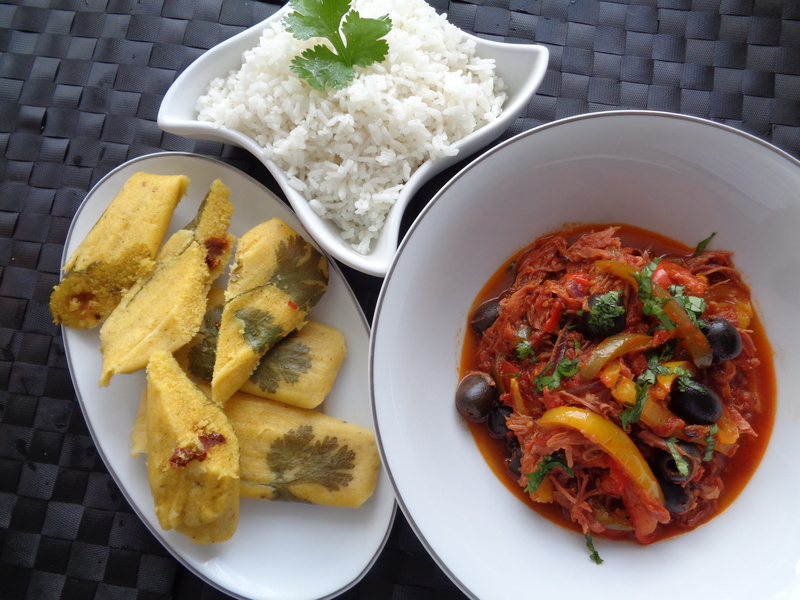 Serve with Pure white rice or Tamales. I served mine with both to provide a choice of accompaniment. Check out the Tamales recipe in the next post. See the starter from this menu here. Listen to the podcast of the radio show here broadcasted on Croydon radio. This entry was posted in Croydon Radio, Mains and tagged citrus, Cuban, grapefruits, olive, pepper, pork, scotch bonnet, tomato, vinegar. Bookmark the permalink.